The Megama Albums – Available Again! When JMR first started, we posted an item called “The Lost Albums” regarding albums that have disappeared. 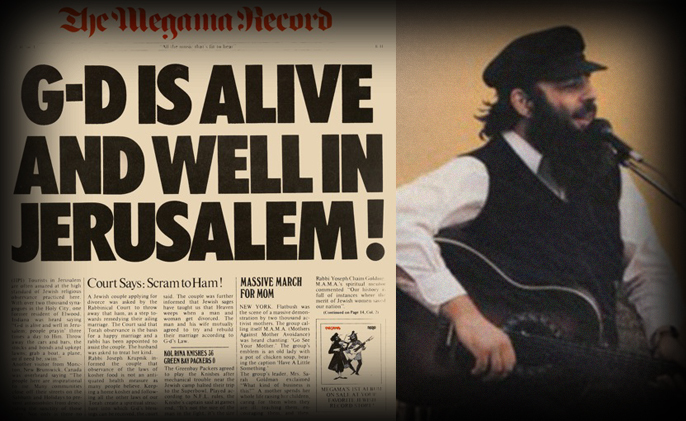 Among those albums, we mentioned the classic Megama records, whose most famous song, “My Zeidy”, was for many years the anthem of the Baal Teshuva movement. The Megama Duo, made up of guitarist and vocalist Moshe Yess and the multi-talented Shalom Levine (violin, percussion, vocals, kazoo and more), sang songs that were haunting, humorous, irreverent and ironic. They influenced the likes of Abie Rotenberg and many others. Visit www.MosheYess.ca to hear the sound of one of Jewish music’s most formative, creative and memorable groups, and to learn more about Moshe Yess. *While the sound quality ain’t great quite yet, it’ll certainly remind you of the vinyl experience!